He was a flat-out, knee-crawling thug with the morals of a weasel on speed. But he was Nixon’s vice president for five years, and he only resigned when he was caught red-handed taking cash bribes across his desk in the White House. Agnew was the Joey Buttafuoco of the Nixon administration, and Hoover was its Caligula. They were brutal, brain-damaged degenerates worse than any hit man out of The Godfather, yet they were the men Richard Nixon trusted most. Together they defined his Presidency. Not having been alive during that time period, that was always my impression. Nixon, a snake and a crook, a classic paranoid, and a deeply human monster, surrounded himself with people like him. They brought out the worst in him, but his own personal pathologies empowered thuggish neo-fascists like Haldeman and Tex Colson and G. Gordon Liddy. It was a wholly criminal administration, and that starts at the top. The Current Occupant has all of Nixon’s terrible tendencies, but absolutely zero of his redeeming qualities. Nixon worked his way up from the bottom, and certainly seemed to think that government existed for a reason. Nixon was also smart, and paid attention to the world, and thought about how to maneuver America as a superpower. Don’t get me wrong: all of Nixon’s instincts were cheap and cruel, and his adminstration gleefully perpatrated war crimes throughout the world. I also don’t buy the glassy “Nixon would be too liberal for Republicans today!” nonsense. He’d be leading every Blue Lives Matter March. He was venal, but he wasn’t an idiot. Trump is a venal idiot. And with like attracting like, he’s surrounded by venal idiots, crawling out of the lowest rungs of American public life. Few embody that more than “Dr.” Sebastian Gorka. 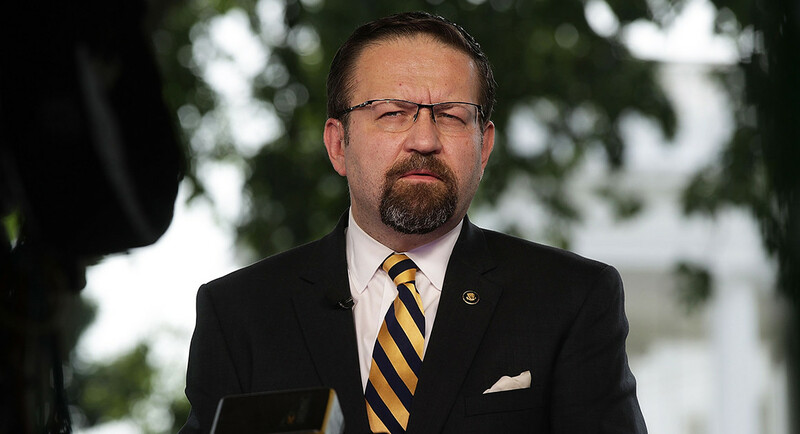 As someone on the fringe of the counter-terrorism community for a while, back in my Yemen days, the name Gorka would float across the radar now and then. I was not in the upper echelon, and far from it. This isn’t pulling rank. But holy cow: everybody knew how dumb this guy was. He was a joke. Nothing he said made sense, and literally no one took him seriously as a counter-terrorism thinker. Please don’t think this was because Gorka was a “conservative” or even because he is a bigot and an absolute Islamophobe. It was because he didn’t know anything. His ideas were half-baked talk radio nonsense, without any actual knowledge of the subject, the region, the religion, anything. He couldn’t answer basic questions. This wasn’t a liberal field, anyway. Sure, maybe in our idiotic politics the idea that we should understand the actual causes of terrorism, and maybe try to figure out what is happening in the areas where it thrives, is seen as “liberal”, but that’s nonsense. It’s a field filled with ex-military types, warrior scholars, people who spend their whole lives trying to stop AQ and ISIS and other militant groups. They are people who take things seriously. Gorka spoke apocalyptically, but never, ever seriously. And now he’s some kind of security advisor (though no one really knows what he does). He is somehow talking about North Korea and nuclear exchanges, and perhaps influencing the President of the United States on matters of life and death. He has the gall to pull rank on the Secretary of State, and then blame the fake news for quoting him. He’s all over the news. Earlier this week he decided to drop some knowledge of the idea of lone wolf terrorists. “There’s no such thing as a lone wolf,” Gorka said. “That was a phrase invented by the last administration to make Americans stupid … There has never been a serious attack or a serious plot that was unconnected from ISIS or al Qaeda,” he continued. This is perfect Gorka. A lot of CT Twitter and the internet has disproven the idea that there haven’t been any lone wolf attacks, but that’s sort of beside the point. Absolutely no one claims that attacks happen in complete isolation. No one would imply that people wake up and decide to kill in the name of ISIS without ever having heard of ISIS. Everyone agrees that ISIS deliberately inspires people to become radicalized, taking advantage of people lost in our weird dissolved modernity. That’s their goal. They’re really good at it. But that doesn’t mean these are all coordinated attacks. Very few are! The term “lone wolf” is inelegant and misleading and probably stupid, but Gorka is arguing against a point of view that doesn’t exist. But he doesn’t care. I don’t even think he is deliberately lying. I think he just doesn’t really understand the issues, and doesn’t know how to think about them, except through the narrowest fake tough-guy lenses. I don’t even think he’s lying when he says the last administration invented the term to “make Americans stupid.” I think he actually believes that. Maybe because, in his specific case, it worked? I don’t want to delve into that. My point is, Trump empowers these guys. There are very hawkish CT figures who I disagree with, but who are serious thinkers. Trump isn’t bringing them on. He’s brought on the worst of Fox News cannibals and Breitbart culture warriors who think every issue is entirely about liberals. He’s filling his administration with every sexless geek and vicious carny in the world of American bigotry. It’s an administration perfectly in his image. And because of that, they are all over the news. Puffed up bigot and know-nothing dope Gorka gets to go on TV and be called doctor while spouting his nonsense. We’re in a timeline where nuclear war with North Korea and all fates depend partly, even slightly, even infinitesimally, on Sebastian Gorka. That’s enough for impeachment to me. This entry was posted in Foreign Affairs, Media Watch, National Security and tagged counter-terrorism, Gorka, I Can't Believe I Have A Gorka Tab, terrorism. Bookmark the permalink. Fair enough, and rightfully so. I guess I should have said that Nixon would be doing it for cynical reasons.